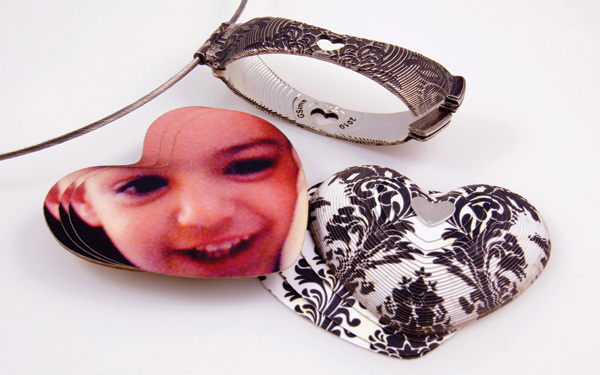 Photo Locket- RP, Cast Silver and Laser Cut Photographs, 2010. 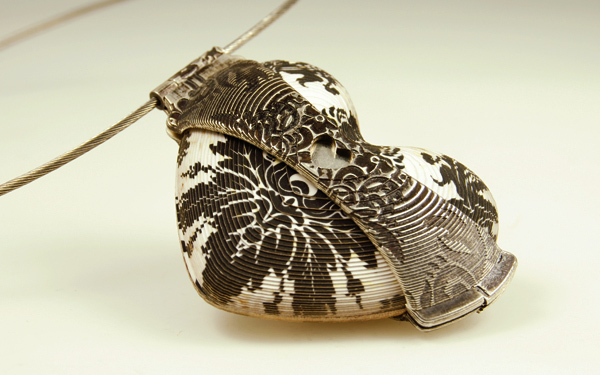 Photo Locket (Open)- RP, Cast Silver and Laser Cut Photographs, 2010. Hidden Heart Locket- RP, Cast Silver, Gold Foil and Diamonds, 2010. 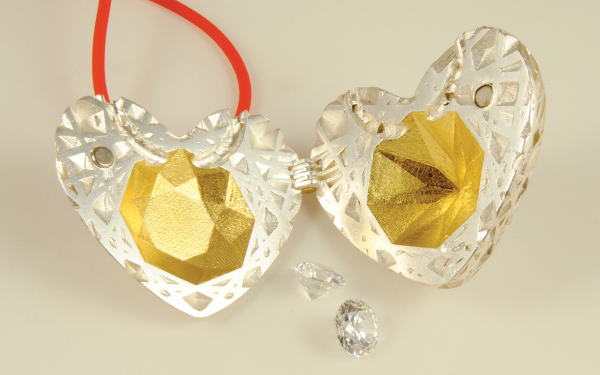 Hidden Heart Locket (Open)- RP, Cast Silver, Gold Foil and Diamonds, 2010. 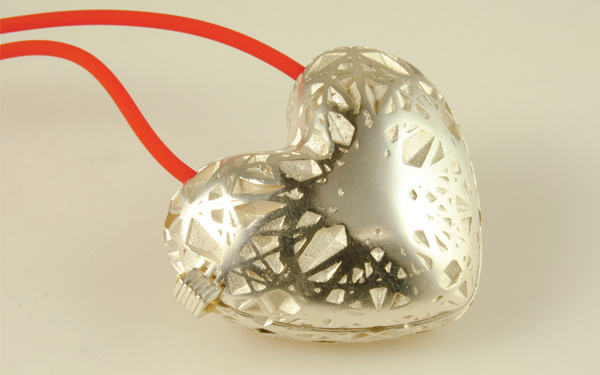 Hollow Heart Locket- SLA Resin, Silver Chain and CZs, 2010. 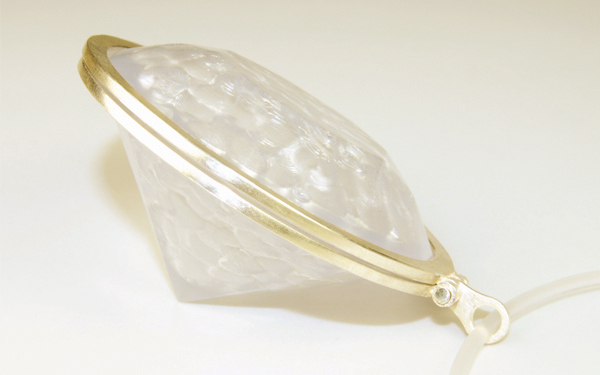 Hollow Heart Locket (Open)- SLA Resin, Silver Chain and CZs, 2010. 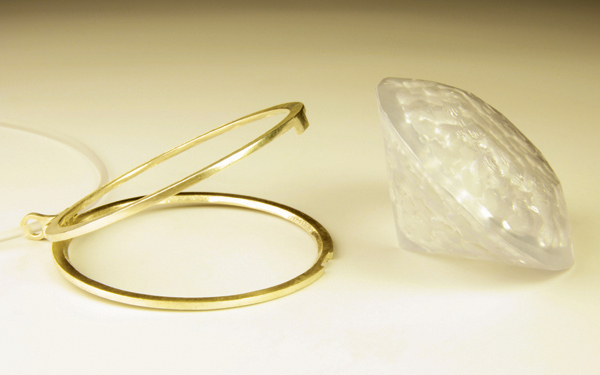 Split Earrings- RP, Cast Silver, Diamond and Powder Coating, 2010. 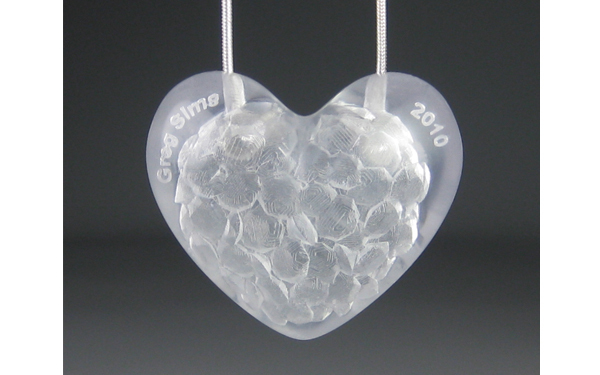 Diamond Heart Pendant- SLA Resin, RP and Cast Silver, CZs, 2010. 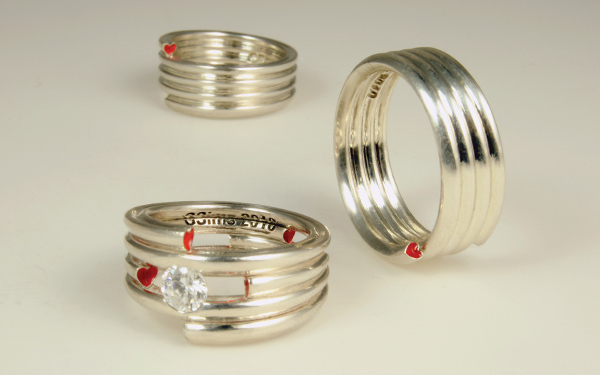 Wrapped Around Your Finger (Ring Set)- RP Cast Silver, CZ and Resin, 2010. 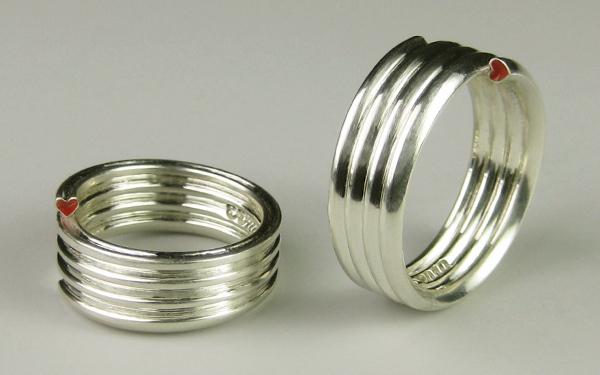 Wrapped Around Your Finger (Wedding Bands)- RP Cast Silver and Resin, 2010. 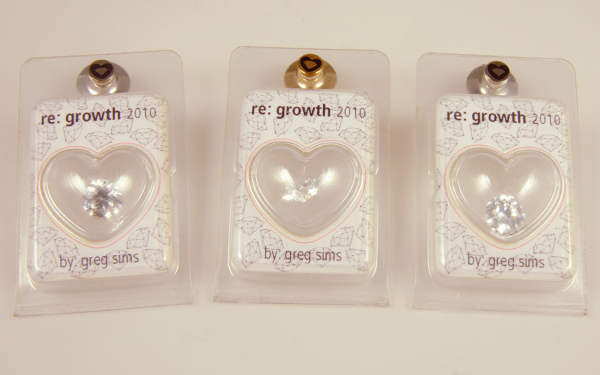 Seed Packs (Pin)- Vacuum Formed, Laser Cut and Laser Marked Tie Pin, CZs, 2010. 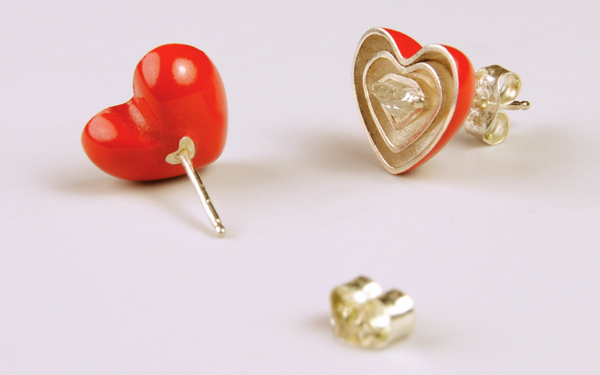 A different take on one of jewellery's biggest cliches.The Hearts series explores love and sentiment through several jewellery forms. Lockets open to reveal precious photographs, sparkling gems and ghostly voids. Small hearts are extruded into wedding rings to create subtle and playful expressions of love. 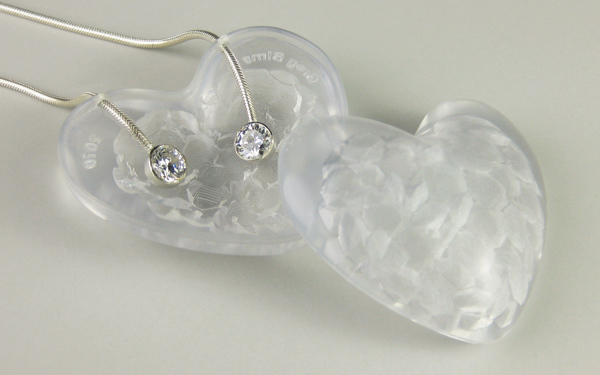 Earrings made of a heart-shaped geode hold a diamond within.